This 6000㎡ property is positioned below a discharge point for storm water drainage of a 300-hectare residential development. An engineered solution had two pipes, each one meter in diameter, at the top of a precipice, and consequently they created significant erosion during heavy storms. Invasive blackberry vines quickly replaced the eroded natural vegetation. The landscape architect aimed first to control the storm drainage and restore natural environments before combining with the architect to create a unique setting for a new residence. 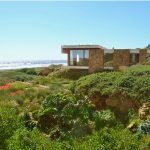 The new contemporary Mediterranean residence is balanced above a unique sandstone formation affording prominent coastal views. Besides the ocean, the site has a numerous characteristics and sensitivities. A full 360 degrees of views and considerations were taken into context. 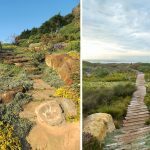 Storm water control, filtration spring, natural runoff, environmental habitat restoration, and visual appeal were the primary objectives to make the most of the site. ▲鸟瞰视野，可以看到农舍、蓄水池和汇入沿海湿地的径流。泉水从左边的断崖流下并带来灌溉水源。住宅周围的交通路径自然地融入场地之中。Aerial view above the residence reveals a caretaker’s cottage, storm water pond and outflow to the coastal wetland. The precipice left, continuously weeps spring water and provides irrigation. Circulation around the home is casually informal in context with its environs. ▲建造阶段照片：1.植被平台塑形，2.构建湿地，3. 迁移入口处的巨石，4.利用砂岩建造挡土墙，5.初次种植。Construction photos: 1. Shaping of the grassed terrace, 2. Formation of the wetland, 3. Moving the boulder in the entry, 4. Positioning sandstone blocks as a retaining wall, 5. Initial planting. ▲入口花园-沙滩岩石搭配着浮木和不规则的巨石。花园中种植着蕨类、苔藓和莎草等远古植物。Entry Garden – Beach stone mosaic with a driftwood tree and unusual boulder. Primitive plants forms include ferns, moss and sedges. ▲住宅位于一处沉积的砂岩构造之上。巨大的石块被用于分隔草坪和下方的花园。石块间的空隙中填满了多肉植物、多年生植物和地被植物。The residence straddles a sedimentary sandstone formation. 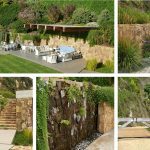 Large sandstone boulders were used to create elevation between the lawn and garden below. Voids between the boulders were filled with a medley of succulents, perennials and ground covers. ▲被砂岩包围的火坑成为主卧室视野的焦点。香鸢尾、苦槛蓝、薰衣草和袋鼠爪种植其间。The fire pit, a visual point of interest from the master suite, is centered within massive sandstone blocks. Crocosmia, creeping myoporum, lavender and kangaroo paws are a part of the planting composition. ▲倾斜的草地与高尔夫球场相连。为了拓宽视野，花园中未设置传统的围墙。品种丰富的植物带来四季的气息，融合了多种沿海植物的特征。A sloped plane of grass deftly links the garden to golf. Traditional perimeter fencing was eliminated to broaden the visual canvas. A wide variety of plants combine for seasonal interest and echo a random natural distribution of coastal plant associations. ▲从远景图可以看到宽阔的水墙、悬臂式的顶篷、位于湿地上方以桥梁连接的入口路径，以及覆盖着首层空间的屋顶花园。A perspective from the housetop reveals a weeping water wall, a cantilevered canopy shading the outdoor living room, a bridged entry crossing a small wetland and a green roof of succulents covering the ground floor of the residence. ▲色彩缤纷的屋顶花园，种植着野牛草、蓝羊茅和各类景天属植物。花盆内种植着非洲芦荟。A roof garden covering the lower level is filled with vibrant colors and textures. Sesleria and blue fescue were blended with a variety sedums and echeverias. Aloe africana, in the planters, add accent. ▲交通路径中运用了石材、木材、花岗岩、鹅卵石以及硬土等不同材料。右图中的木栈道通往沙丘上的浮木长椅。砂岩石块被开凿为阶梯。Pathways are limited and composed of unassuming natural materials including pebbles, wood, compacted earth and stone. Here a wood boardwalk leads to a driftwood bench cast adrift in the dune. Also above are steps carved into a sandstone boulder. ▲形态各异的设计元素：1.休闲和用餐平台，2.错落的墙壁分隔出入口车道和高尔夫球场用地，3.台阶将住宅与自然地貌融为一体，通过桥板与平台相连，4.有孔水墙，5.手工制作的木门。Distinctive design elements: 1. El quincho – living and dining terrace, 2. Staggered walls separting entry drive and golfer ́s easement, 3. Steps fusing the house to the natural sandstone formation. A bridge adjoins the terrace, 4. Porous water wall, 5. A craftsman ́s gate. ▲微微抬升的木栈道连接了沙丘和草本植物园。背景处的断崖在日落时带来天然且具有戏剧感的光影秀。A lightly elevated boardwalk provides a transition from the reconstructed dune to a protected herb garden. The cliff in the background produces a natural and dramatic light show for every sunset. ▲从雨水排放场地望向湿地牧场、沙丘和住宅。湿地植物包括苔属植物、莎草、灯心草、鸢尾、雨百合和君子兰等。View across the storm water course to the wetland meadow, restored dune and residence. Wetland planting includes a blend of carex, sedges, juncus, irises, rain lilies and kaffir lilies. ▲水池被用于存蓄从悬崖上流下的雨水，并将其引入沿海湿地。桥梁连接了农场和高尔夫球场。This pond basin was formed to contain turbulent storm water released from the cliff. From here, it is released to a coastal wetland. The bridge provides a connection to the farm as well a link between golf holes. ▲智利大黄被种植在住宅角落的屋檐下。前景处是一个用于存蓄泉水的小池塘，可用于湿地中各类植物的灌溉。Nalca, or Chilean rhubarb is protected under the cantilevered corner of the house. In the foreground, a small pond featured as a collection point for spring water and overflows to irrigate a fusion of wetland vegetation. 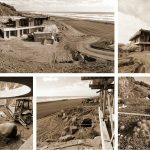 In the mid 90’s, a 300-hectare residential resort community was built along a coastal bluff 8 kilometers south of Santo Domingo, Chile. 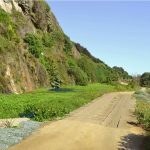 The majority of the storm water collected from the new roads and roofs was diverted to the southeastern corner of the property and subsequently discharged from the top of a 40-meter cliff. Following a few major storms, a new defile was formed and many cubic meters of sand were washed out to the sea. Blackberries quickly populated the scarred environment. We were challenged to control the storm water discharge and recreate a favorable ecological environment. Although challenging, the aforementioned cliff seeps offered opportunities to harness and govern the water. The home’s location is very important to the homeowner because the site essentially links the existing development to a future planned community and working farm. We addressed and planned access to the residence with arrivals from both the farm and existing development. 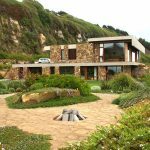 A prominent and central sandstone formation extending towards the ocean was quickly identified as a center piece for the home’s foundation. 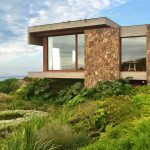 Its unique formation adequately elevates the main floor or second level, with views above the garden and to the ocean. Considering the rich context of the environment and geology, we sought to create numerous settings within the site’s framework to add interest and attraction. Architecturally, the idea was to keep the lines and forms simple and elegant. 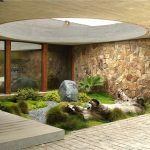 Similarly, the surrounding landscape would be a rich composition of colors and textures with very subtle geometry for circulation and visual cues. Control of the storm water included a new pond to eliminate turbulent forces, water velocities and erosion. Rainwaters and residual waters were directed from the pond through a series of drops and into a newly formed coastal wetland. 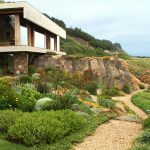 Spring waters emanating from the sea cliff were captured and diverted through the garden to reduce hydrostatic pressures and secure the home’s foundation. 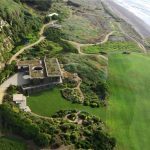 Finally, significant grading and earthwork helped divert coastal breezes and create microclimates. During the clearing a 2-ton granite boulder was discovered on top of the sandstone formation. Unlike any other stone, it is clear it was an ocean deposit from another era. It is featured in an entry courtyard with another relic, an old driftwood. Carefully selected beach stones and were used to form a mosaic between ancient plant types. A circular roof void couples the courtyard to the heavens above. The upper floor includes the kitchen, dining and living rooms, and a master suite, all of which have unique views to the surrounding landscape. The dining room overlooks a wetland, where the controlled seepage is released, and a reconstructed sand dune positioned to conceal immediate views to an adjacent golf hole. The sedimentary sandstone and its eroded voids were filled with succulents with bright colors in juxtaposition with cooler ocean hues. The master suite looks over a lawn linked directly to the golf course, a simple sweeping stone wall and a collection of individually placed sandstone boulders. A sharply inclined hill was formed to separate the site from the adjacent lot serves as a colorful backdrop to the garden. The lower building level was carved into the side of the sandstone formation and contains three guest rooms and a small common living, all of which are graced with a simple walkout to a grassed terrace. Green roofs cover both the lower and upper levels. Modest materials including stone, wood, decomposed granite, pebbles and hardened soil were featured for walkways, driveways and terraces. Impermeable paving was limited to the parking and a “quincho” or exterior patio. The vehicular driveway passes under an open carport and is connected to both the residential development and private farm. Simple wood gates mark the lot limits. 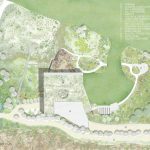 A pedestrian pathway circles the site joining the collective elements and gardens. The quincho includes a living and dining space covered by cantilevered beams and canvas. 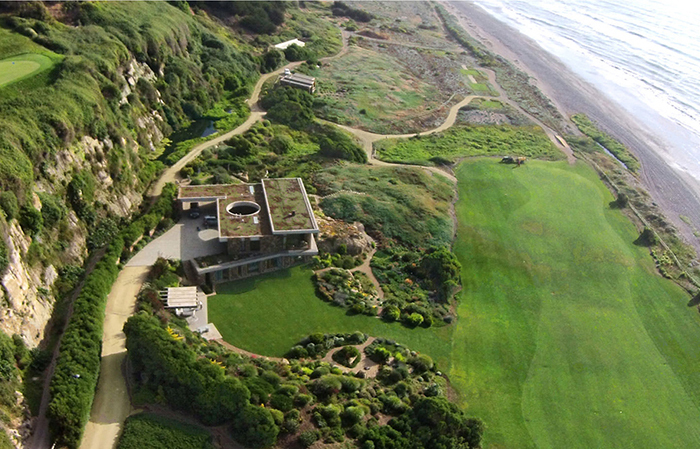 We graded the site so views would extend across the lawn and over the golf to the ocean so to eliminate sights of passing golfers. An isolated fire pit was included as a visual punctuation from the master bedroom and provide a magical retreat. The path was interrupted where it intersects with the lawn. Steps were carved into several of the large boulders and placed in transition zones. A boardwalk that spans the wetland extends onto the dune destined to a driftwood bench. In general, driftwood was used as accents, bird perches, plant dividers and containers. Lastly, an easement was included for the golfer’s circulation. Borrowing finish treatments of the home, we created a series of staggered stone walls to separate and conceal views to the cart path from the entry courtyard. Spring water coming from the cliff was guided to a weeping stone wall set directly behind the exterior dining terrace.The water is then directed to a low point and used for irrigation. Additionally, water is guided to a small pond in the middle of the wetland where it overflows to nurture the vegitation. Eventually it joins the runoff from the storm water system leading to the coastal wetland. Irrigation relies solely on the spring water, and the natural discharge remains unchanged. 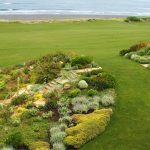 After establishment, much of the landscape requires little or no water, including the dunes, roof and rock gardens. A strong earthquake buckled a weary section of the sea cliff several hundred meters south of the home site. Its collapse covered a portion of a small wetland at the bottom of the cliff face and consequently required removal of the rubble. Large blocks, often more than 3 tons, were moved to the home site and used to create natural walls. These boulders define the limits of many of the planting zones and create vertical variations similar to the architecture. Scars from the impacted storm water discharge zone were transformed into a pond, stream, and wetlands. Eroded dunes were constructed from spoils of the excavation of the ponds and wetland and they were eventually capped with sand. 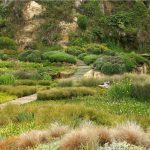 Revegetation simply mimicked vegetation types and densities from similar environments. Plants were harvested and replanted within hours and during the normal wet winter season. The dune only required supplemental irrigation through the first summer while the wetland emerged free of need. It is often difficult to create an organic, natural appearing solution when collaborating with engineers. Initial details included rigid borders and concrete lined channels, all of which would have been a huge challenge to conceal. Following several workshops and meetings, we were able to increase the width of the flow zones to reduce discharge velocities. 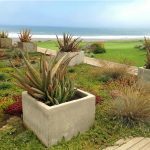 These changes permitted covering of the concrete forms to allow vegetation to take hold. The channel sides were almost entirely eliminated and the flat base was changed to form a basin to allow for natural sedimentation and plant recurrence.